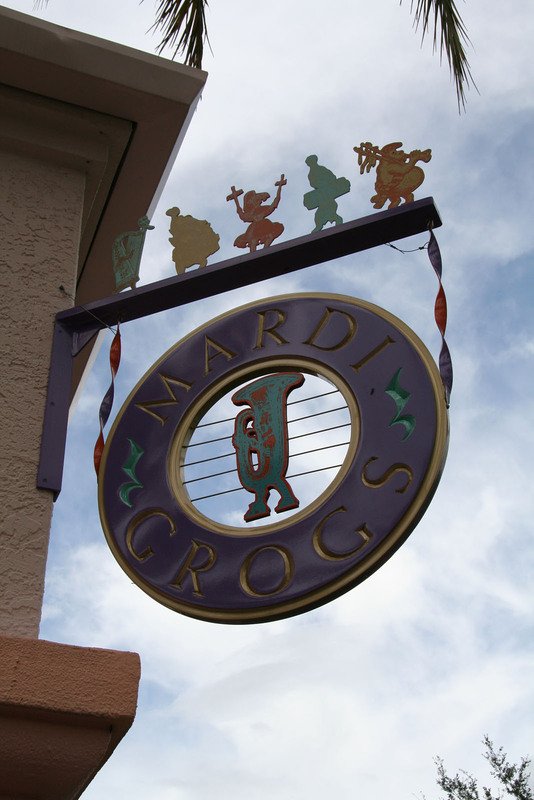 Every day is Fat Tuesday here! 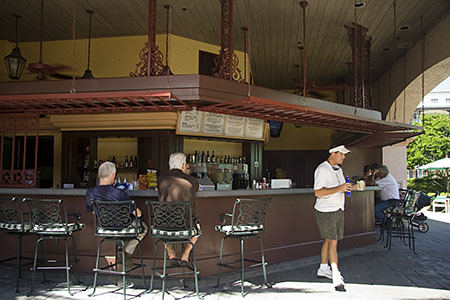 Grab yourself a relaxing beer or a refreshing frozen tropical cocktail, along with a light snack, from this festive Mardi Gras inspired bar situated right next to the main Doubloon Lagoon swimming pool at Port Orleans French Quarter. Parents can enjoy their adult beverages while still being able to watch out over their children in the main pool. You can even order your drink to go, and take a leisurely stroll along the Sassagoula River. 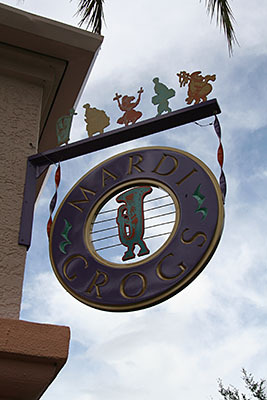 On 7th July 2015, Mardi Grogs started offering a cold-food service alongside their regular drinks menu under the new banner theme “Big Easy Splash”. 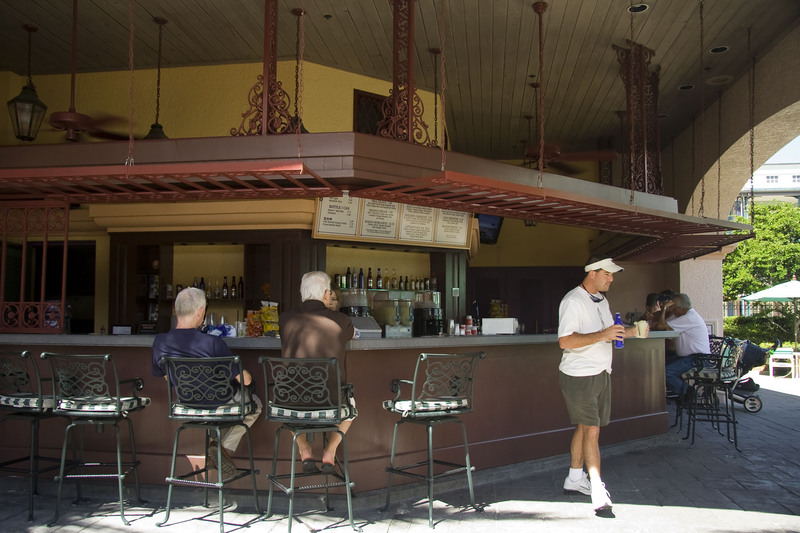 Also a new range of Port Orleans exclusive specialty cocktail drinks was added to the menu (including the famous New Orleans rum-based “Hurricane”) along with poolside servers to take guests’ orders. Non-alcoholic cocktails and smoothies are also available. Note: only plastic containers are allowed on the areas immediately adjacent to the pool, and food and drink are prohibited in the pool itself. Discounts accepted: Disney Dining Plan Snack Credits for selected non-alcoholic drinks as noted below. Grey Goose Cherry Noir Vodka, Odwalla Lemonade, fresh Lime Juice, and Grenadine topped with Sprite $9.00 ? Pau Maui Handmade Vodka, Sammy’s Beach Bar Rum, Hendrick’s Gin, Cointreau, and Sweet-and-Sour with a splash of Coca-Cola $10.25 ? Cruzan Mango Rum, Coruba Coconut Rum, Bols Crème de Banana, with Orange and Pineapple Juice and a float of Grenadine $9.50 ? Crown Royal Regal Apple, DeKuyper Pucker Sour Apple, and fresh Lime Juice topped with Ginger Beer $ ? RumHaven Coconut Rum, Coconut Water, and fresh Lime Juioce topped with Soda Water $ ? Bacardi Raspberry Rum blended with Piña Colada Mix and Raspberry Purée (or $9.25 in regular cup) $12.25 ? Full bar also available. Two alcoholic beverages per person with valid I.D. Don’t leave the pool because you’re hungry! Have your dinner delivered to you! Call from the phone next to the Pool Bar ... just dial extension 5787, option 1. See Sassagoula Pizza Express Delivery Service for menu options and prices.